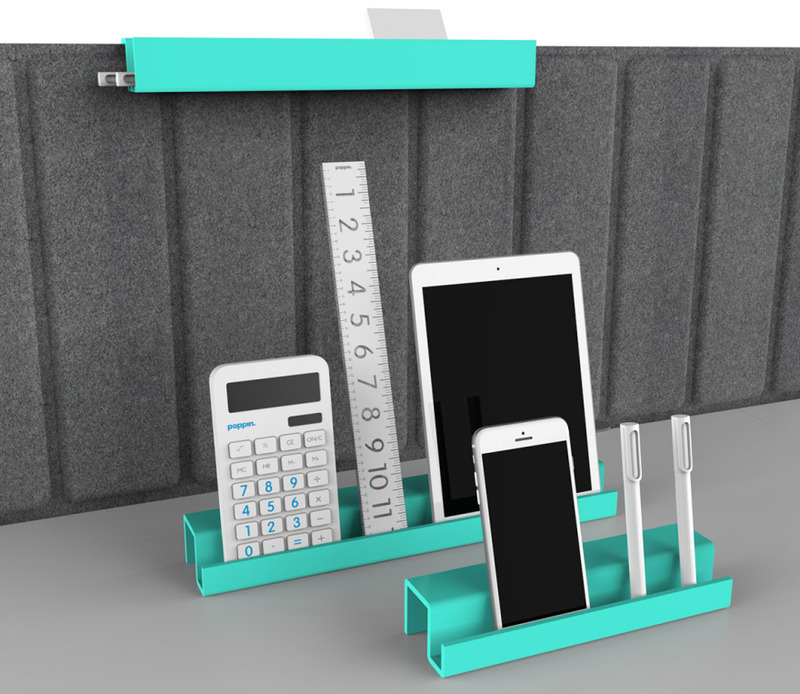 I've long been aware of Poppin's office furniture and supplies, since so many of the products are organizing-related: file cabinets, staplers, pen holders and much more. 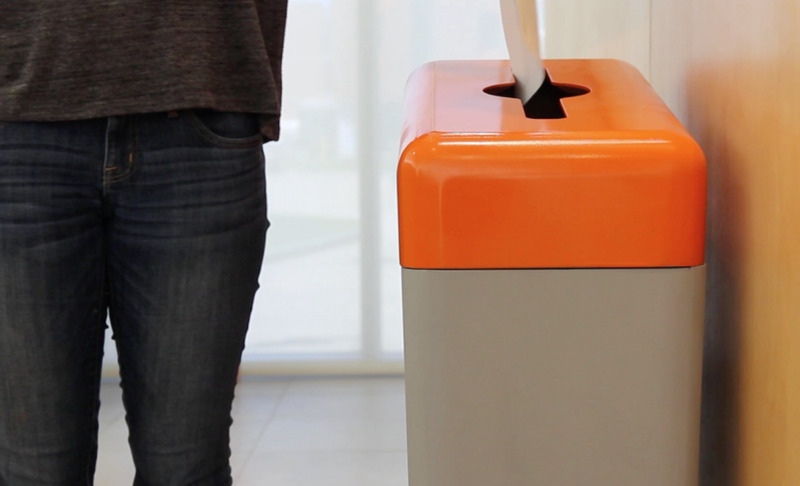 So when I learned Poppin had teamed up with the Rochester Institute of Technology for its Metaproject—an industrial design senior project—I was intrigued and eager to see what the students had developed. Many of the designs were specifically geared to modern offices with their unfortunate trend toward "shrinking or shared work spaces." 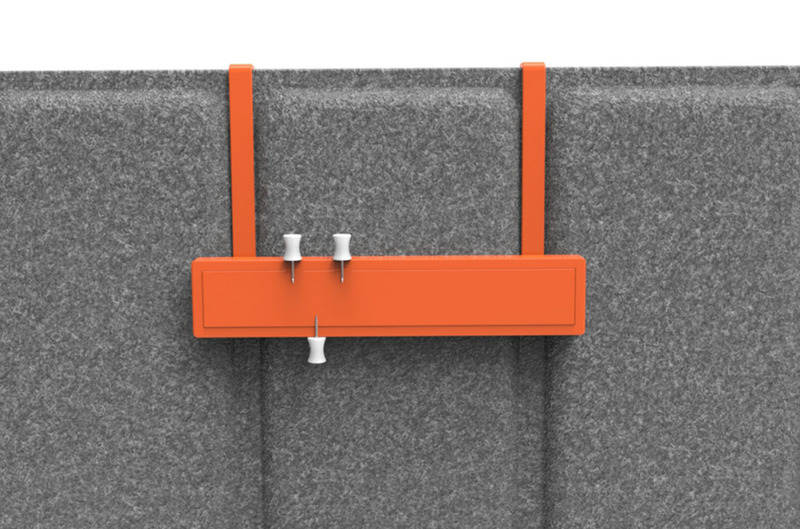 The High-Rise Hanging Family from Evan Cincotta is one of those, with products designed to go over Poppin's privacy panels. 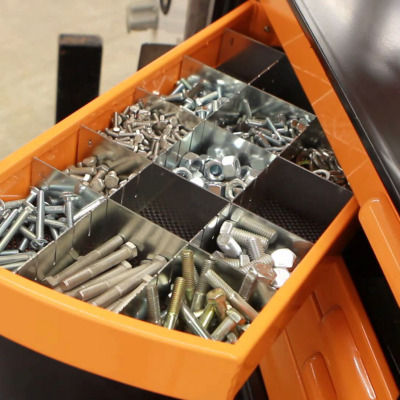 The series includes large and small bins, a cord holder, a magnetic bar and more. It's a nice way to use the vertical space, keeping things close at hand but off the limited desktop space. But there's one significant drawback: The person on the other side of the panel is going to see the hooks that keep these in place. And if the people on both sides of the panels both want to use these items, they might interfere with each other. 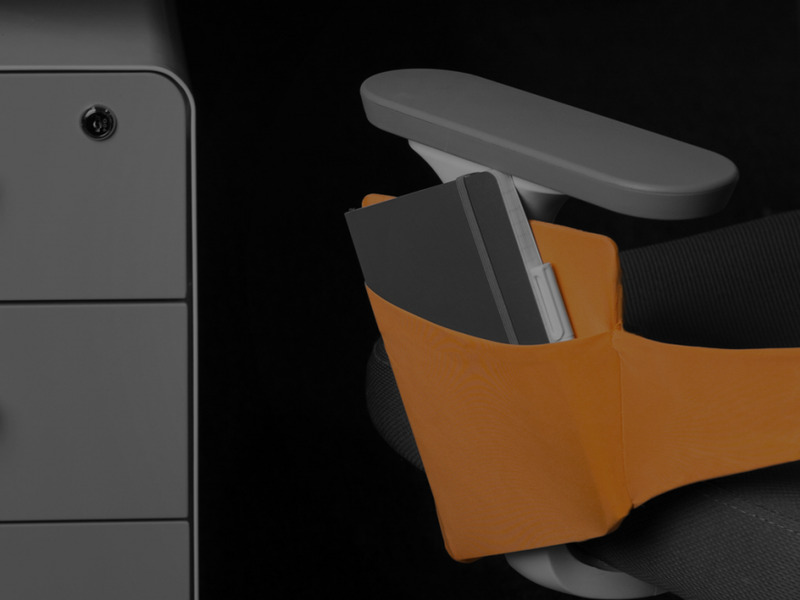 Kyle Laidlaw designed the Extrude Universal Holder, which can sit on the desktop or go over a privacy panel; that's a clever bit of flexibility. However, I doubt that most users would want to use this for something like pens (which would work better in a cup of some sort) and I don't know many people who use calculators any more. But it could hold notepads as well as cell phones and tablets (if those latter two aren't going to go in some sort of charging station). Instead of looking upward for storage areas, Ethan Young looked down and created the Under Shelf, which attaches to the leg of a Poppin desk. 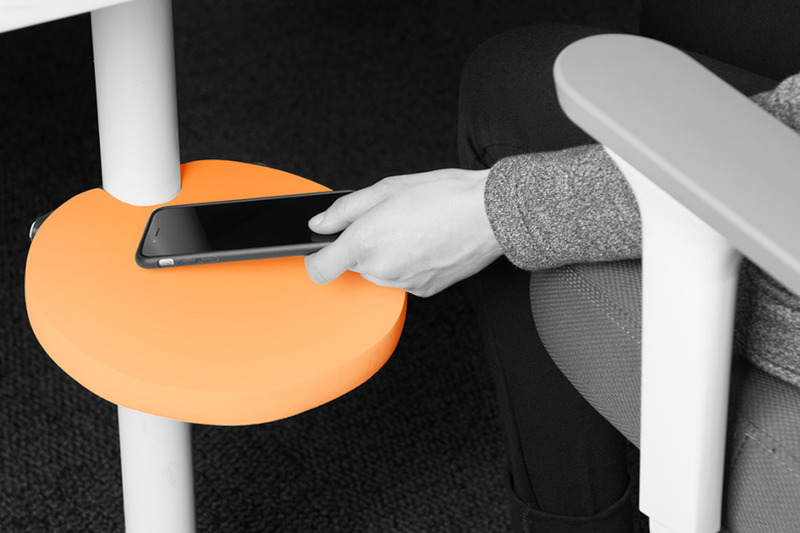 I'd be a bit worried about things getting knocked off that shelf when users get up and down from their desks, but it might be something they adjust to with no problem. 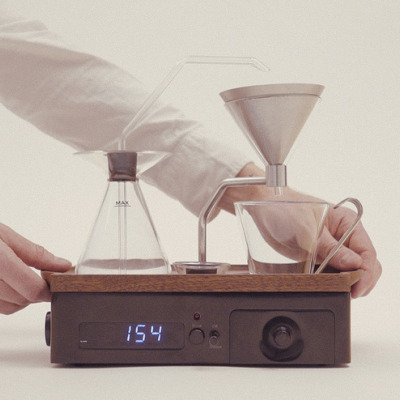 (I'd still be reluctant to put a cup of coffee on there, though.) Looking at the Poppin desks, it seems like there would be plenty of room for this little shelf if the end user didn't put a file cabinet under the desk. 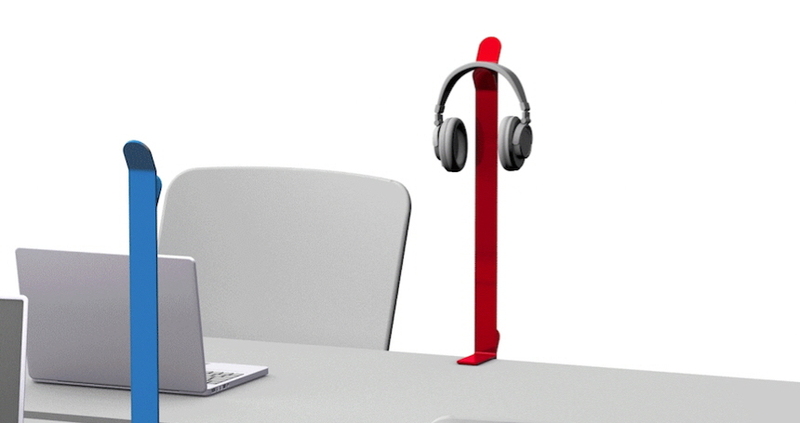 Branch attaches directly to the table, so there's no dependency on dividers. In a crowded environment, bags often get shoved under the desk, and Branch provides a nice alternative. And keeping all of the commute items together helps ensure nothing will get left behind at the office. 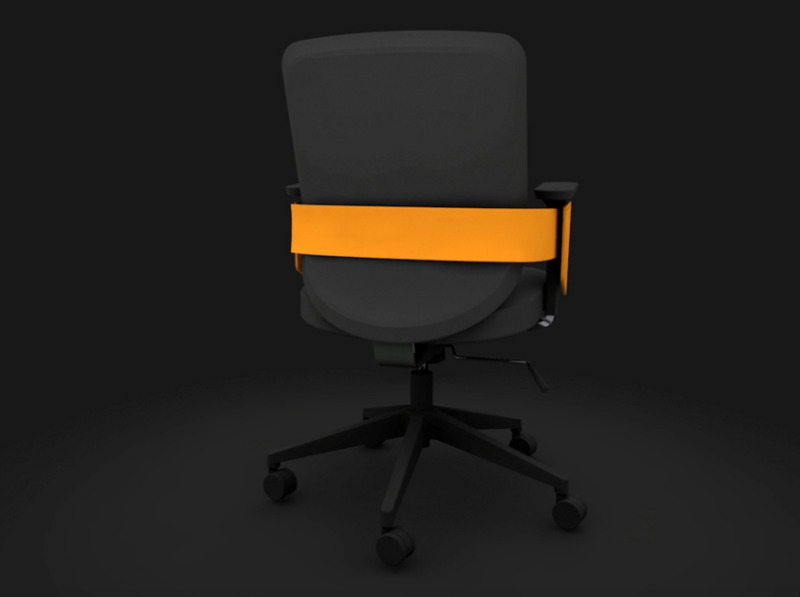 Branch uses a friction fit clamp that slides onto the edge of Poppin's Series A desk system. Babiarz considered alternative designs that would fit on other desks, but the attachment mechanisms became too complex. Other designers chose to add storage solutions to the chairs rather than the desks. Emily Moore designed the Task Chair Overhanger to accommodate many of the same things that Branch handles, including scarves, bags and hats. 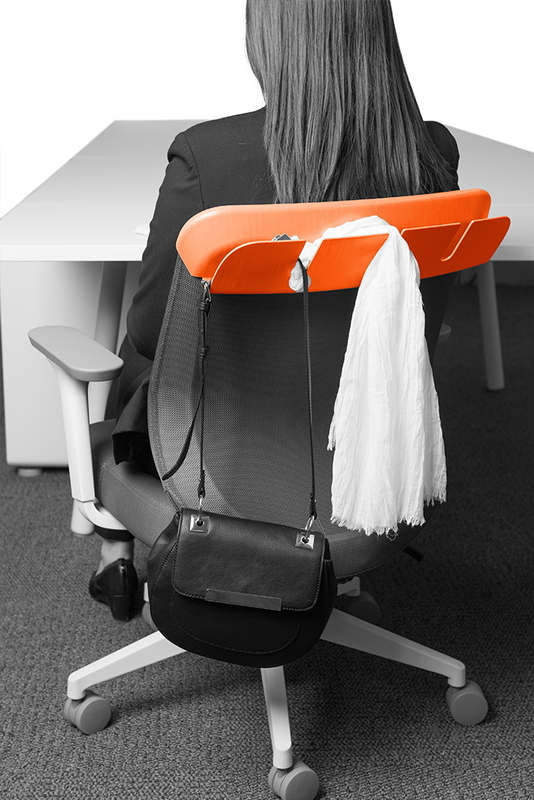 If a coat is then hung over the chair (including the Overhanger) it keeps the other items out of sight, providing a smidgen more security since the user's belongings aren't out on display. 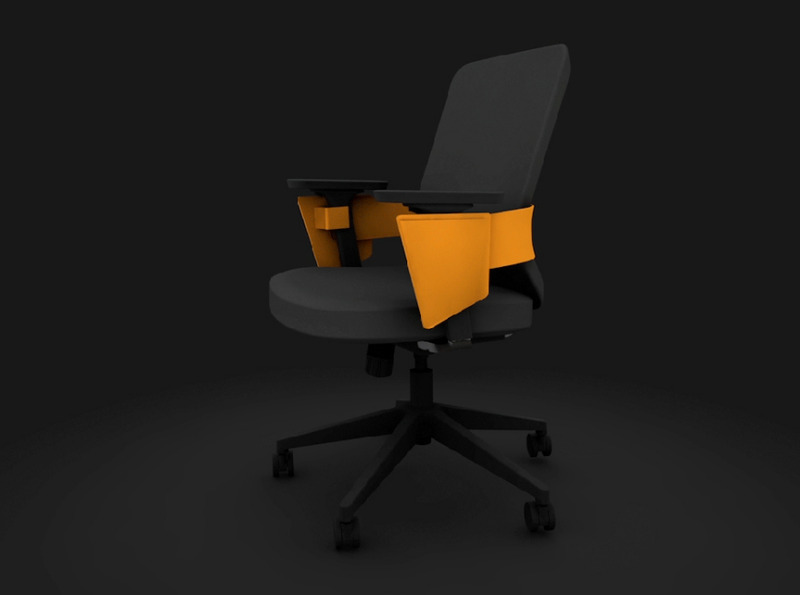 Dylan Panarra designed Side Note to add pockets to the chair, under the arm rests. 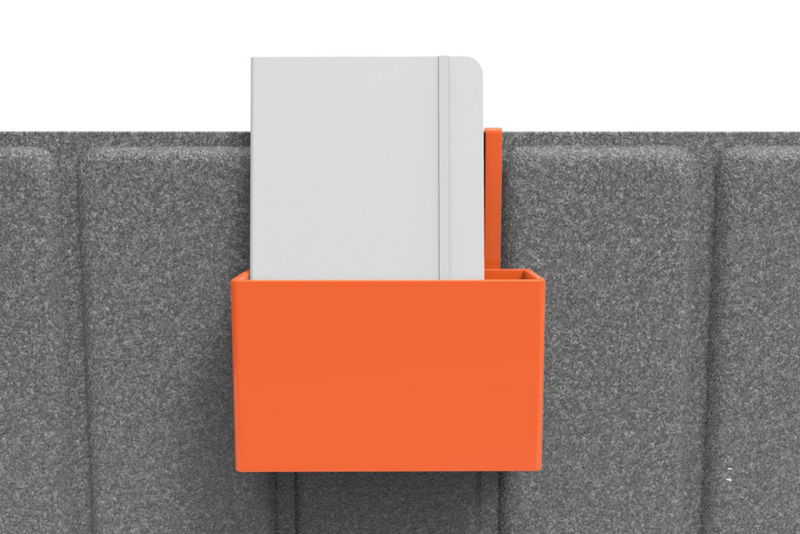 Notebooks, files and other items can be stashed in the pockets, freeing up desktop space. 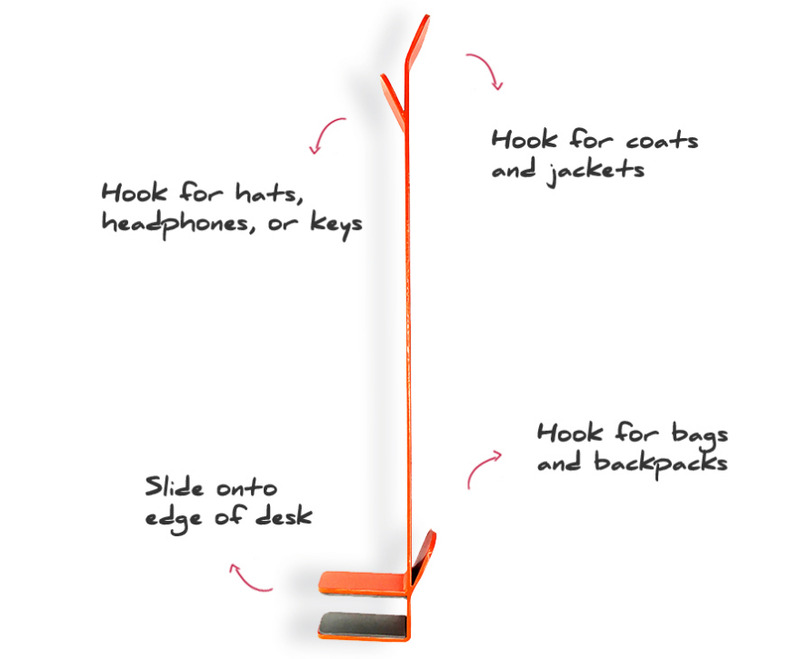 Side Note just hooks onto the chair, so it's easy to install. 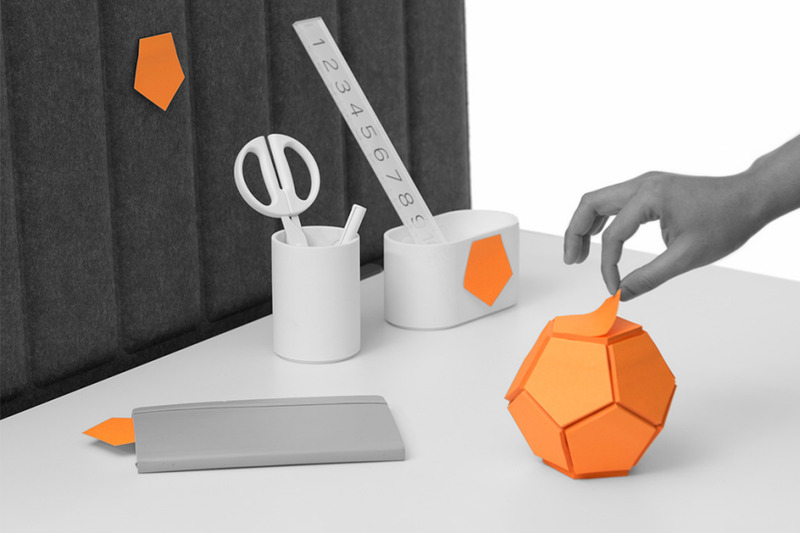 I've had clients who use a lot of sticky notes, and they often wind up with the little pads buried under some papers; the Sticky Note Ball would avoid that problem. And unlike some creative variations on sticky notes, these are a reasonable shape for note-writing (although not quite as good as a basic rectangle). 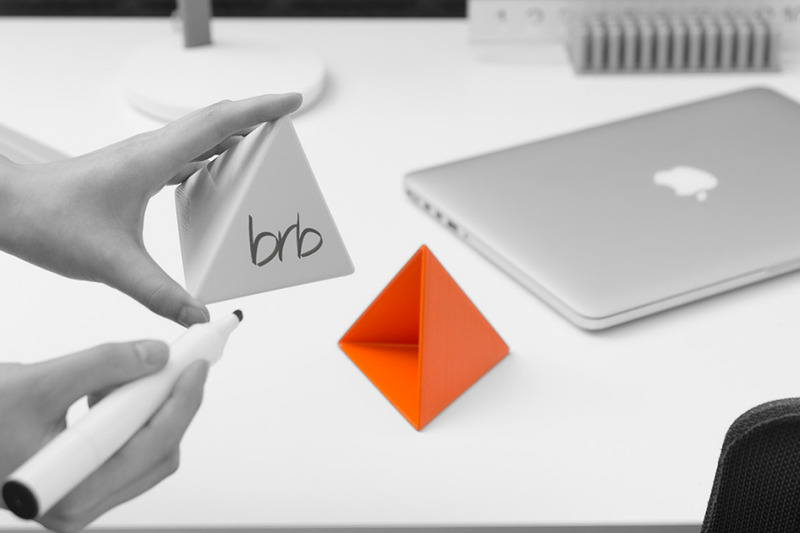 Small shared work spaces seldom have room for a whiteboard, but they would have room for the Pyramid Messenger designed by Sandro Hatibovic. Only one surface is exposed, so anyone walking by would see only the message intended for them and not anything written on the other surfaces. 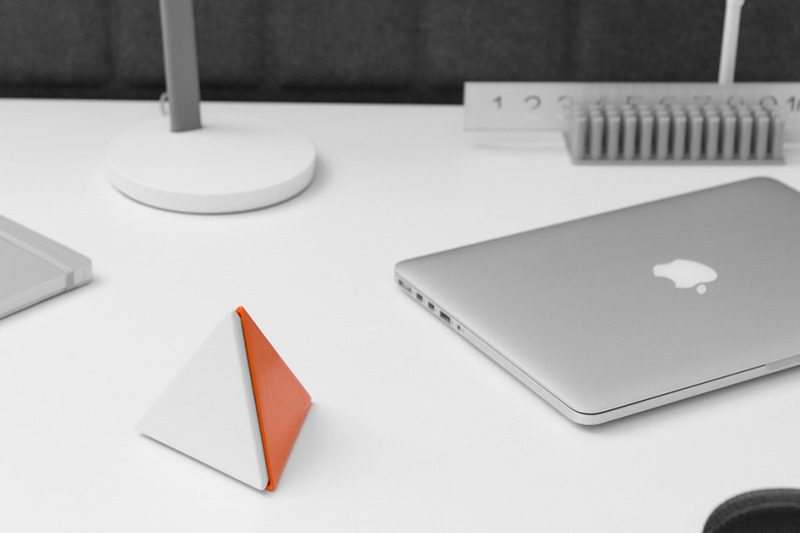 Hatibovic says the Pyramid Messenger could be used for anything from messages such as "back in 5 minutes" to a checklist or to-do list. However, it really seems too small for those lists, unless they are much shorter than what most people have. I can't see very many uses for a message/note board that's this small. Kasia Kozak designed a communal Recycling System for an open office. 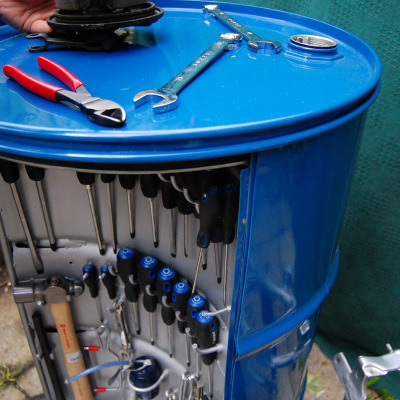 The lid cutouts indicate what materials are taken; this bin is designed for single-stream recycling since it would take both paper (the long slot) and cans and bottles (the round slot). 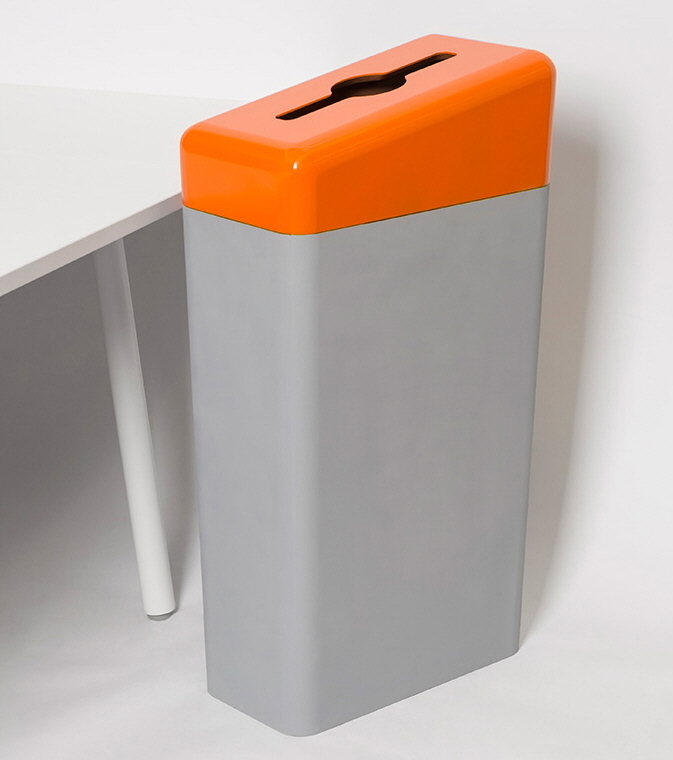 The rounded edges on the bins are a nice touch, avoiding sharp edges (and fitting in with the look of the Poppin file cabinets). 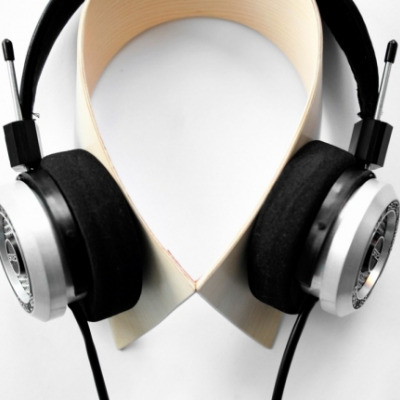 The angled lid makes it easier to see those cutouts.